BENGALURU. NOV.30. The HMAI Karnataka Branch in association with Vasan Eye Care hosted a seminar at their hospital located at Rajaji Nagar. Mr. Krishnan welcomed the gathering. 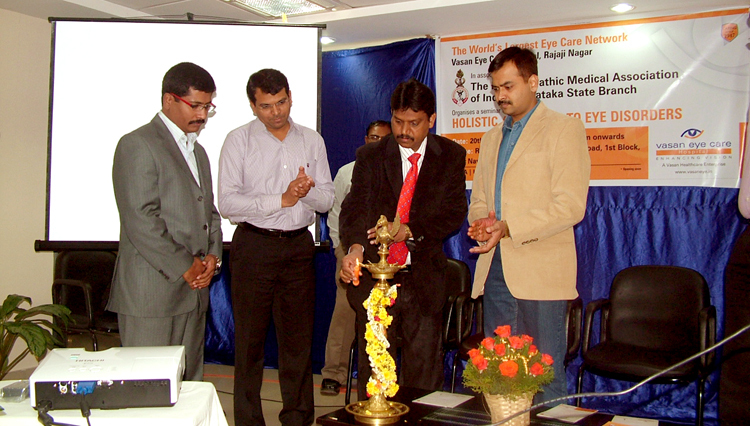 Dr. Veerabramhachary, president, Karnataka Board of Homoeopathy system of Medicine inaugurated the seminar. Dr. Rajesh and Dr.K.P Jayath, HMAI also participated. Dr. D Ananad, CMO and Dr.Naveen Gopal presented the latest surgical techniques in encountering the eye disorders with a audio visual aids. Dr.N.Madan, Dr.Ashok Dantakale, Dr.Mahesh, and Dr.Ranjan Das presented their contribution on homoeopathic perspective pertaining to eye disorders. Dr. K.P.Jayath secretary of HMAI proposed vote of thanks.